Tomlinson currently throttles Gasse, a 48-foot MTI catamaran, with driver/owner Tor Staubo. Just a few weeks ago, John Tomlinson, the multi-time world champion offshore powerboat racing throttleman and co-owner of TNT Custom Marine in Miami, turned 50 years old. Of course, thanks to a steady diet of intense daily exercise—Tomlinson is an endurance athlete—and his movie-star features, he doesn’t look his age. Most people who meet him put him in his early 40s. Tomlinson is smart and engaging, often funny—we often laughed ourselves stupid during long, hot days testing boats for Powerboat magazine—married to a lovely woman, Donna, and widely well-respected in his field. And guess what? He does. But don’t think for a moment that Tomlinson, who started TNT Custom Marine in 1984 with his business partner, Mike Thomas, and started offshore racing two years later, didn’t work for it and doesn’t continue to work for it every day. “I get up early and hit the gym, and try to be here by 8 a.m.,” says Tomlinson. “I usually stay till 6 or 7 p.m. I get here, make my rounds on the marina side [TNT Marine Center, which Tomlinson and his partner purchased eight years ago], the outboard side, the service side and the rigging shop. I go over the previous day’s tickets, and then I’m off to quoting rigging jobs, quoting outboard jobs, quoting outboard sales. Once I get caught up in the late morning, I’m out in the yard helping out with anything or out on the water testing boats. I deal with customers who pop in with questions—it’s constant communication between me, my guys, and our customers. 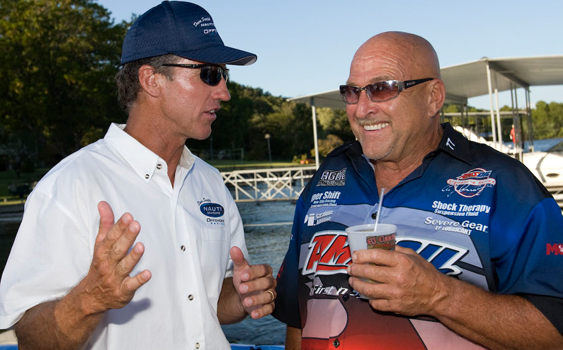 Tomlinson (left) with fellow offshore racing world champion Bob Teague. 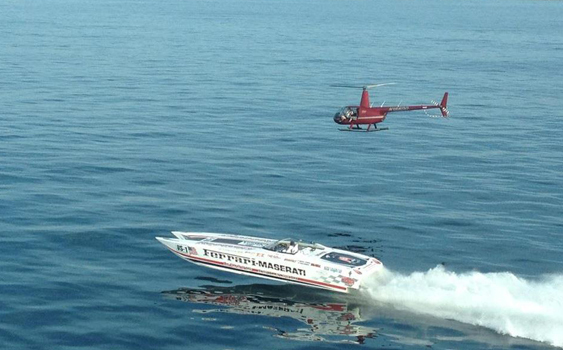 Everything includes offshore racing, of course. During the past two-plus decades, Tomlinson has throttled for and managed some of the world’s best-known offshore racing teams. In 1996, he got his first full-time Open-class catamaran throttleman gig with Laith Pharaon in Zero Defect, and they went undefeated that season on their way to a world title. In 1997, Tomlinson and Pharaon teamed up again to win a world championship on the Union Internationale Motonautique Class 1 circuit, the premiere series in offshore racing. 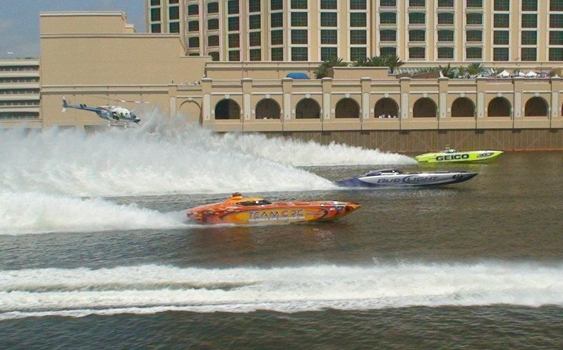 Other noted rides that have seen Tomlinson on the throttles include Drambuie on Ice with driver/owner Forest Barber and (later) driver/owner Hugh Fuller in the boat of the same name, as well as an array of high-quality throttling spots in the Anheuser-Busch-backed boats of driver/owner David Scott. When pressed to pick a high point in his offshore racing career, Tomlinson struggles. Among the catamarans Tomlinson throttled for driver/owner Dave Scott was Bud Light (at center). Tomlinson’s current offshore racing deal is with Gasse Racing. 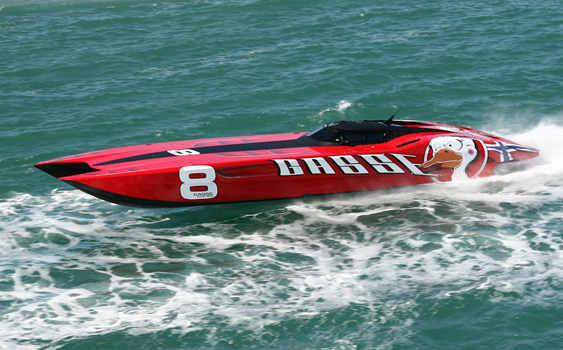 He throttles the boat, a 48-foot Marine Technology, Inc., catamaran with twin Mercury Racing 1350 engines, with driver/owner Tor Staubo of Norway. In addition to throttling the MTI cat, Tomlinson is the team manager. Most of the Gasse crew comes from his full-time staff at TNT Custom Marine. “With the exception of the last three years with Dave Scott’s boats, that’s how we’ve always done it,” Tomlinson explains. “I throttle and manage the team, and I provide the crew. We charge for what we do, whether we’re working on the boat or racing it. Tomlinson, who set an Around Long Island record this summer with retired offshore racing notable Stuart Hayim, describes the 2012 offshore racing season so far as “hit and miss,” but also says the sport has been “hurting” for the past several years. Regardless, he takes the responsibilities of first keeping his teammate in the cockpit safe and, second, winning as seriously as he would if the sport were in its glory years. This summer, Tomlinson throttled this 42-foot MTI cat with driver/owner Stuart Hayim to an Around Long Island record. Despite the lack of competition, Tomlinson says his driver remains enthusiastic. Staubo, like all of Tomlinson’s former teammates, is a speed-lover at heart. Offshore racing is merely his most recent expression of that passion. “Tor is really enjoying the seat time and practice in the boat,” says Tomlinson. “He comes from a car racing background in Europe. He has it in him. He’s only been doing this a year now—last year we did the Lake of the Ozarks, the New York SBI race, and Key West—but he’s excited and enthusiastic. He’s a great guy. Matt Trulio is an award-winning journalist who has covered the high-performance powerboat world since 1995. He wrote for Powerboat magazine for 17 years and was the magazine’s editor at large until it ceased publication in 2011. Trulio is the founder, editor-in-chief and publisher of speedonthewater.com, a daily news site that covers the high-performance powerboat realm. He’s also the editor of Sportboat magazine.